3. Do you know anything of any trip of said petitioner from Maryland to Virginia, or from Virginia to the City of Washington, and of the circumstances attending the same, and the duration of stay, and whether any such trip or stay was with the sanction or assent, or against the will and wish of the defendant, Miss Clarissa Purnell? State all your knowledge on these subjects fully and at large. 4. Do you know anything further material for the defendant: if so state your knowledge fully and precisely. 1st What is the age of Miss Clarissa Purnell and who would be her heirs if she should decease 2th State whether or not I. Purnell Pendleton has been or is now a favoured relative of Miss Purnell? 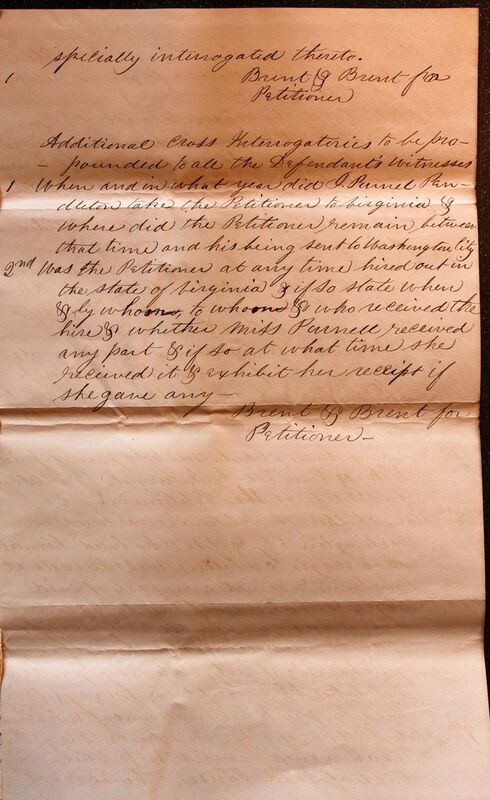 3th State fully the reason & cause of I. Purnell Pendleton's taking with him to Virginia the Petitioner, & whether Miss Purnell did not give the petitioner absolutely to I. Purnell Pendleton? 4th Where has I. Purnell Pendleton resided during the last seven years? 5th Have you never heard either Miss Purnell or I. Purnell Pendleton declare the Petitioner to be the property of the latter & if so when and where? 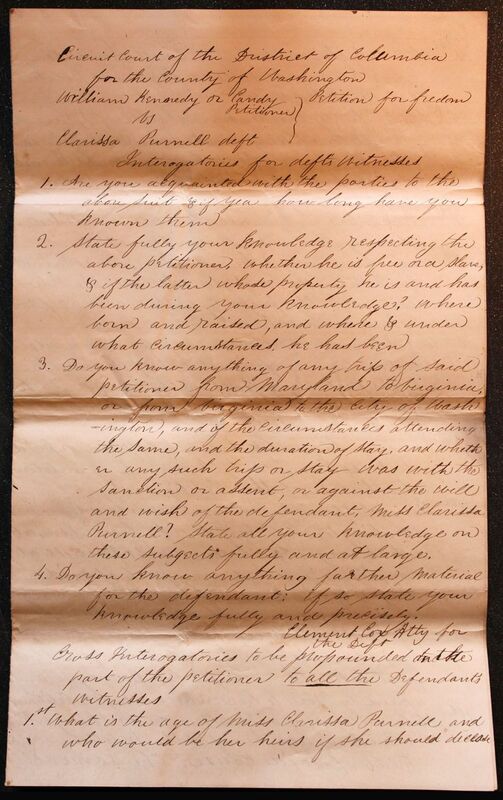 6th Has I. Purnell Pendleton to your knowledge at any time represented the petitioner to be his property & dealt with him as such & was it with the privity and assent of Miss Purnell? 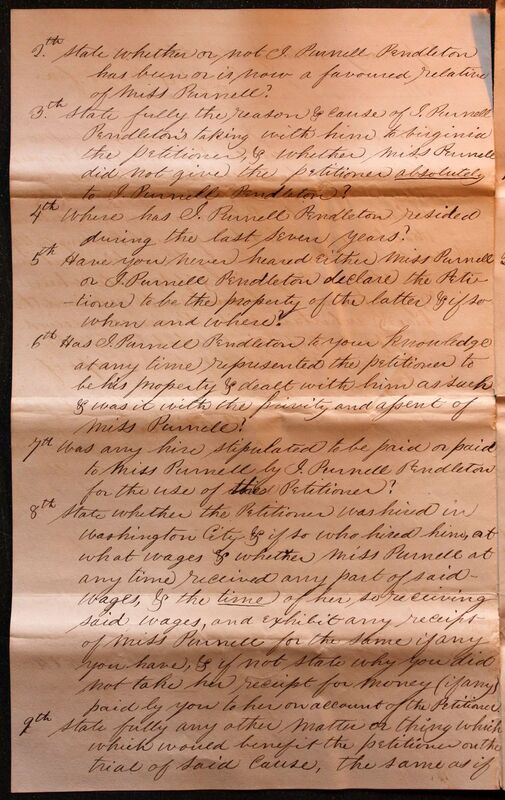 7th Was any hire stipulated to be paid or paid to Miss Purnell by I. Purnell Pendleton for the use of the Petitioner? 8th State whether the Petitioner was hired in Washington City & if so who hired him, at what wages & whether Miss Purnell at any time received any part of said wages, & the time of her so receiving said wages, and exhibit any receipt of Miss Purnell for the same if any you have, & if not state why you did not take her receipt for money (if any) paid by your to her on account of the Petitioner. 9th State fully any other matter or thing which which would benefit the petitioner on the trial of said cause, the same as if specially innterrogated thereto. 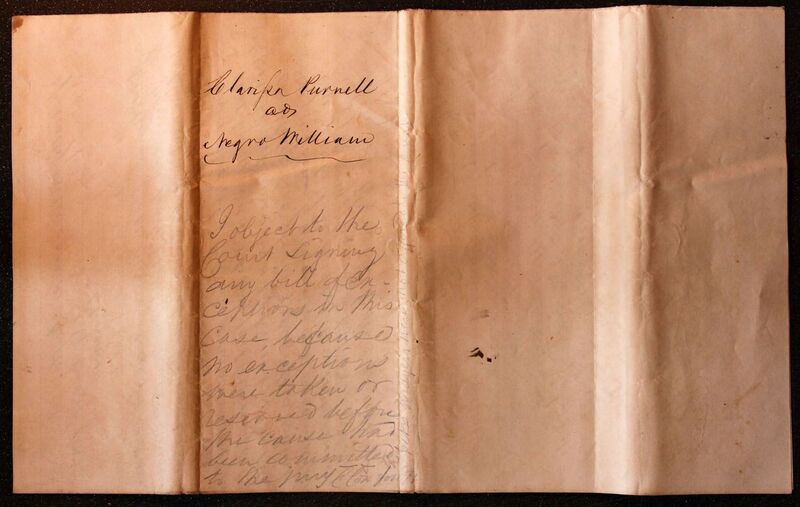 2nd Was the Petitioner at any time hired out in the state of Virginia & if so state when & by whom, to whom & who received the hire & whether Miss Purnell received any part & if so at what time she received it & exhibit her receipt if she gave any. Brent & Brent for Petitioner.